Won't talk about the weather, take no notice of it like a little boy and it might come into line! Next weekend is actually a weekend and a half at Cobar. Remember the great ad's, "The Cobar Grey Mardi Gras". 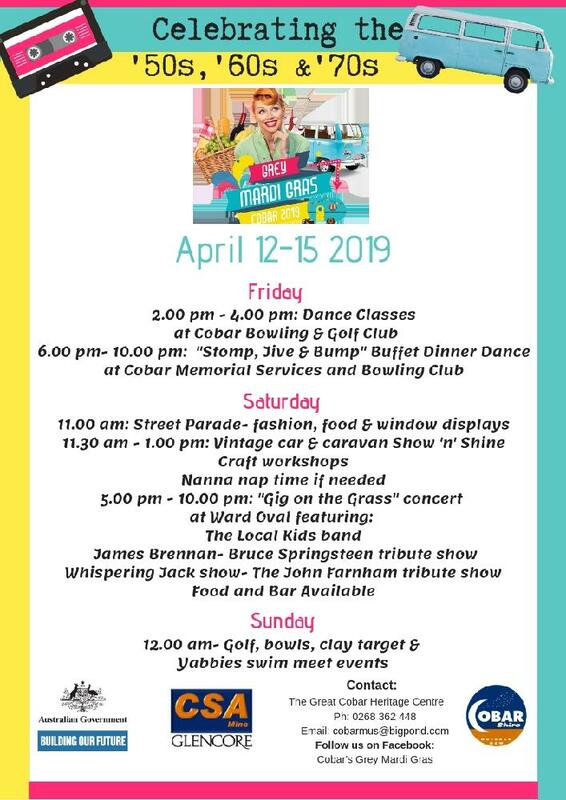 It's all happening in Cobar so let them entertain you. 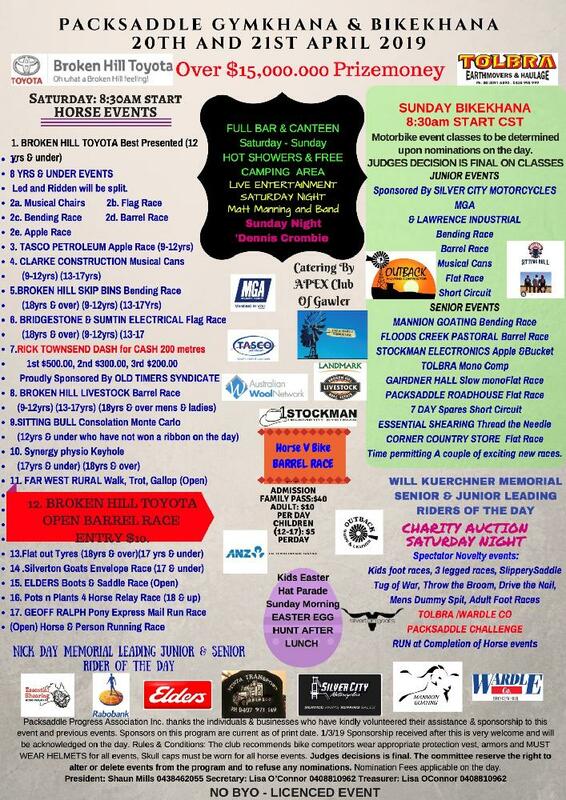 We then have Easter upon us, and stretched from one end of the outback to the other is, "The Packsaddle Gymkhana and Bikehana", have a look at the brochure attached, it's all happening. Leroy will look after you at the roadhouse and a jammed packed 2 day programme. Then, down the bottom, Wentworth of course is another packed weekend of festivities. You can't go to both so decisions, decisions! Following on from that we have the big Pooncarie Gun Shoot, a 2 day event with clay shooters coming from near and far. However, you'll have to all split up because White Cliffs needs a team of you to head up to their Rodeo and Gymkhana on that same weekend 26/27. 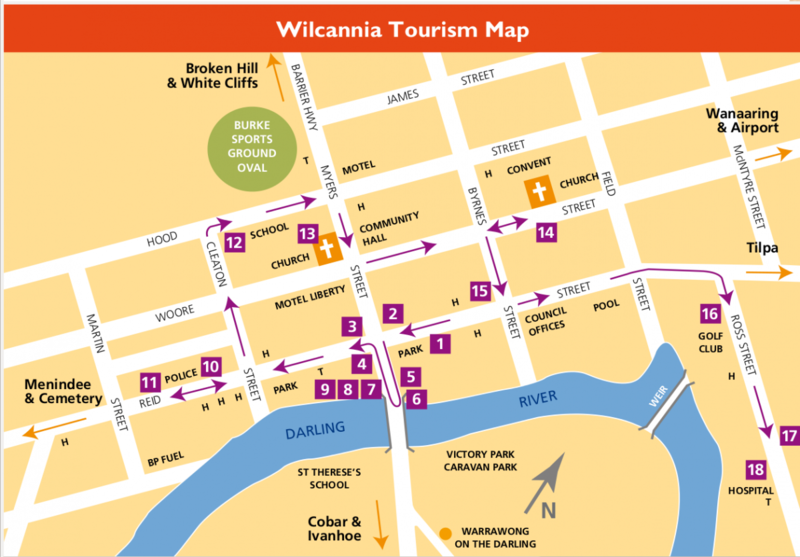 Now of course, this is over the Easter weekend, and just to help you all on your way, the Wilcannia driver Reviver caravan is going to be operating on Good Friday, Easter Saturday, and Easter Monday, 10 AM to 4 PM each day. So please drop in, have a coffee and a laugh, both free! And tell us the latest gossip and the latest joke! Love to see you. We'll delve into May in a week or 2 so you can plot your course ahead, till then, Have a great week and don't forget to be careful on parts of the Cobb highway as it's presently undergoing surgery. Machinery everywhere. Take care now and say g'day to a stranger, they then become a friend! Be great if any of you could print the attached out for Packsaddle, thanks heaps, Bill Elliott. WCTA. "Don't ever be afraid to alter your decision. Tradition has cost people a fortune over the years."